Take part in this years Easter Egg Hunt in Willenhall Memorial Park on Sunday 21st April! Are you looking for some Easter fun? Visit Willenhall Park on Sunday 21st April between 10.30am and 1.30pm to take part in their Easter Egg Hunt. To take part in this year's Easter Egg Hunt, you must register online here. Be quick, only 200 tickets! 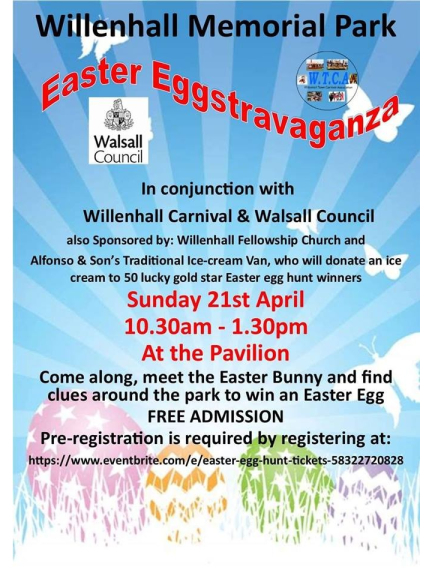 The Easter Egg Hunt will take place at Willenhall Memorial Park, Pinson Road, Willenhall, WV13 2PW.